The Roth 401(k) is a relatively new retirement investment option. It offers an interesting mix of two different types of accounts: the regular tax-deferred 401(k) and the Roth IRA. Is it the right option for your retirement investing? As with any investing choice, there are pros and cons to each account and investment. Let’s look at some of the major advantages and disadvantages of the Roth 401(k). We’ll start by giving an overview of both the Traditional and Roth 401k plans. Then, we’ll look at the pros and cons of investing in a Roth 401k. As its name implies, a Roth 401(k) is a 401k plan with features similar to a Roth IRA. It has a variety of benefits over the Traditional 401k, depending on your specific financial situation. Most people are familiar with a Traditional 401k because until just a few years ago, this was the only form of 401k plan offered by employers. In fact, you usually won’t even see it referred to as a “Traditional” 401k plan. It is most often simply referred to as a 401k plan. How a Traditional 401k plan works. Contributions into a Traditional 401k are made with pre-tax dollars and the amount of your taxable income is reduced based on the amount of your 401k contributions. When you retire and begin receiving distributions from a 401k plan, the money is taxed as current income. A Traditional 401k may offer a matching contribution from your employer. Some match up to 50% or a certain dollar amount of contributions each year. Employers who match contributions to a Traditional 401k are not required to match contributions to a Roth 401k. When you change jobs you can leave your money in the 401k if allowed by your employer, do a rollover IRA, or convert to a Roth IRA – which will require a tax payment. How a Roth 401k plan works. Just like a Traditional employer sponsored 401k plan, the Roth 401k allows workers to make contributions through payroll deductions. Contributions to a Roth 401k are made with after-tax dollars, which means when you withdraw the money during retirement, you don’t have to pay tax on it again. Withdrawals after the age of 59 and a half years are made tax-free and penalty-free, as long as you’ve had the account for at least five years. Money in a Roth 401k plan can be rolled over into a Roth IRA without penalty or fees when you change jobs. If you work in the nonprofit sector, you can open a Roth 403(b). The government also offers the Roth 401K for Thrift Savings Plan. Which type of 401(k) will you choose? Roth 401(k)s have the same tax treatment as a Roth IRA. With these Roth investment accounts, you choose to pay taxes now at your current income tax rates rather than deferring them to retirement. Whether or not you see this as an advantage or disadvantage depends on your anticipation of future tax rates in general as well as your own personal future tax rates. Many people believe that tax rates will be higher in the future, which makes a Roth 401(k) a smart way to save for retirement. If you do like Roth accounts over the Traditional 401(k) and Traditional IRA where you can defer taxes until retirement, then you should love the Roth 401(k). The account is treated just like a Roth IRA but it has a contribution limit about three times higher than a Roth IRA. Setting up a Traditional IRA or Roth IRA means you have to research a brokerage firm, different investment options, fill out paperwork to open the account, and either set up automatic contributions or remember to invest regularly. That is a lot of effort for busy individuals. Investing in your workplace 401(k) is significantly easier. Contributions come out regularly from your paycheck. You do have to make investment selections when you set up the account, but the pool of potential investments are significantly smaller than at a brokerage firm which makes selection an easier process. 401k plans have Required Minimum Distributions, or RMDs. These are minimum withdrawals you are required to make once you reach age 70½. RMDs apply to all Traditional Retirement accounts, as well as Roth 401k plans (and similar employer-sponsored Roth plans, such as the Roth TSP). However, RMDs do not apply to Roth IRAs. That means you can roll your Roth 401k into a Roth IRA after you leave your job, and make any withdrawals when you want to, instead of being forced to take them due to tax rules. Here are some drawbacks to using a Roth 401(k) for your retirement investing. When you invest through your employer’s 401(k) option you inevitably have fewer investment choices than you have by investing on your own with an IRA. When you look to open up an IRA with a brokerage firm you can choose the best firm for your specific situation; the firm that offers the right investments for your investing goals. With the Traditional 401(k) and Roth 401(k), you are stuck with the investment options your company chooses to put into the plan. You could end up with great, low-cost index investments if your company chooses wisely. Alternatively, you can be stuck with high-cost investments. With IRAs, you simply have more choice. If you prefer to invest in tax-deferred accounts because you believe your tax rate will be lower in retirement, then the Roth 401(k) is not the right investment vehicle for you. You are better off with a Traditional 401(k) or a Traditional IRA. 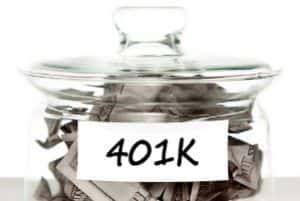 Even though a Roth 401(k) is funded with the same kind of income (post-tax) as a Roth IRA it is still tied to the withdrawal rules of a regular 401(k). That means any early withdrawals before retirement are hit with a 10% early withdrawal penalty. If you take a non-qualified distribution from your Roth 401(k) you can end up paying taxes on the withdrawal even though you funded the account with post-tax income. In addition to the withdrawal rules of a regular 401(k), Roth 401(k)s are also tied to “Required Minimum Distributions.” Individuals must begin to make minimum distributions according to IRS regulations by age 70½ from both regular and Roth 401(k)s. This requirement is not in place for Roth IRAs where the entire account will be willed to an heir if the investor so chooses. Which is Better – Traditional 401k or Roth 401k? Comparing Traditional and Roth 401k plans is similar to comparing Traditional and Roth IRAs. If you are currently in a low tax bracket or expect to be in a higher tax bracket when you retire, a Roth 401(k) or 403(b) offers a better tax benefit tax than the Traditional 401k. Even if you basically stay in the same tax rate, a Roth 401k may have an advantage over a Traditional 401k plan because many people experience higher tax bills when they retire because they may have fewer itemized deductions such as fewer dependents living at home, mortgage interest, etc. If you don’t think you’ll need access to your money at the age of 59½, you can roll your money from a Roth 401k to a Roth IRA without any tax penalties. Once the money is in a Roth IRA, you don’t have to take distributions until you are age 70½. This means you end up with more tax-free growth of your money, and may possibly have more money to last your retirement or to give to your heirs. On the flip side, a Traditional 401k may be a better option if you need to lower your taxable income in the present or if you expect your tax bracket to be lower when you retire. You may also prefer to contribute to a Traditional 401k plan if your employer offers a matching contribution for Traditional plans, but not for the Roth plan. Why not choose both? Finally, it isn’t an all or none proposition. You can contribute to both plans if you wish. Simply divide your contributions as you see fit. This can be a great strategy to take advantage of employer matching contributions and to hedge future retirement taxes. Deciding whether or not to use a Traditional 401(k) or a Roth 401(k) comes down to several factors in your financial life. If you want more flexibility out of your investments and don’t want to be required to withdraw funds, then you should invest in a Roth IRA instead. On the other hand, having contributions directly taken from your paycheck like your regular 401(k) is a nice perk. If you prefer to pay taxes now, then a Roth 401(k) can be a great investment account, especially with the high contribution limit compared to a Roth IRA. What are your thoughts on the Roth 401(k)? Leave a comment and let us know! Why not discuss the fact that Roth 401k’s can be rolled over into roth IRA’s whenever you leave a particular company, thus foregoing the MRD requirements? It is strue it is treated the same as a traditional 401K as you are contributing, but once you roll it over into an IRA it no longer applies. My work just recently began offering a Roth 401(K) option, so I’ve thought quite a bit lately. All of your points are spot on to what I’ve researched so far. The main question that I still haven’t answered for myself is whether my taxes are higher now (go with traditional) or will be higher in retirement (go with Roth). I think I’ve decided that I may end up doing both just so that I don’t have all of my eggs in one retirement basket. What would you suggest? Jake, your question about taxes is one of the more popular questions that arises when it comes to deciding between a Roth or Traditional IRA or 401k. The answer is “we simply don’t know.” We can’t plan for what the government will do 10, 20, or 30 years from now. And we don’t know what our income will be like in retirement. On a personal level, I have a mixture of both traditional and Roth retirement accounts. My IRAs are almost all in Roth accounts, and my 401k is primarily in Traditional accounts (this was my only option when I started it). My personal preference is to pay the taxes now if I can afford it. This gives me more flexibility later in terms of when I have to make minimum withdrawals (or not make minimum withdrawals), and I also know that I can take as little or as much out as I want without having to pay taxes on it. I contribute to my 403B, IRA and Roth IRA. I keep my Roth IRA at a discount broker and have a lot of investment choices. This year I maxed out my contributions to my TSP/ROTH TSP. I put $4000 in the ROTH TSP. Can I still put $5,500 into a ROTH IRA as well, or can I only put $1,500 in a ROTH IRA? The TSP call center could not answer this question…. Thank you! Sheila, the Roth IRA and Roth TSP are separate retirement accounts with separate contribution limits. What you do with one account does not impact the other account. You can contribute up to $5,500 in a Roth IRA in 2018, provided you fall within the income limits. The Roth TSP has an $18,500 contribution limit. Best wishes!